The Power Team brand is a world leader in hydraulic tools, and we are the largest distributor of their products in Europe. 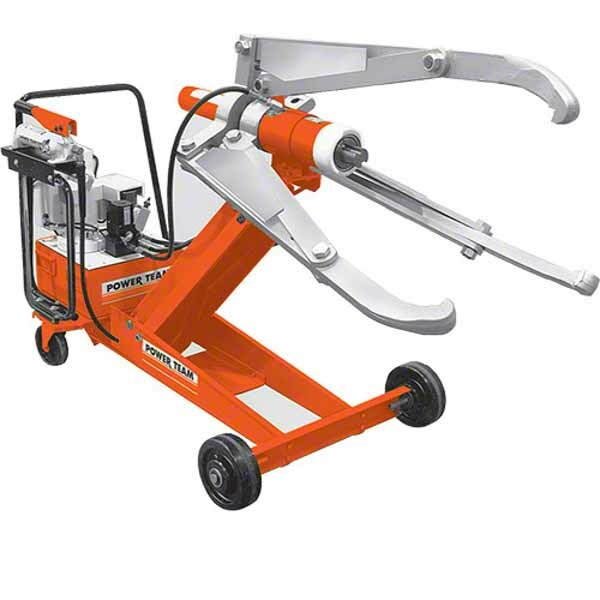 The Power Team universal puller is a superb hydraulic lifting unit which allows for easy and precise positioning of the universal bearing puller. Each SPX universal puller features large wheels, so it is easy to move and store the cart when not in use. It’s the perfect device for installing a range of press-fit parts thanks to the internal puller, hydraulic cylinder and a try-section pulling attachment. The universal puller tool is covered by Power Team’s Lifetime Marathon™ Warranty for ultra-reliability and safe purchasing. The patented universal puller tool from Power Team is available in two different ton capacities, with a range of cylinder stroke lengths. We carry a 55-ton universal bearing puller and a 100-ton universal puller tool, both of which have been rigorously tested to ensure top performance and reliability. No matter which SPX universal puller you choose, you can be sure that you are getting a top-quality unit which will allow for easy and efficient pulling, thanks to Power Team's near century of experience at the forefront of the hydraulics industry. When you've found a Power Team universal puller that meets your needs, you will find placing an order with us quick and easy. If you need assistance finding the right SPX universal puller, contact our expert team today who will be able to help you find the right unit.